There are many Hollywood movies that changed every dynamics of the film industry. They cast every actor or actress giving them same importance and same luxury of vision. Every star meant to work with prominence and suitable screenplay. Among such masterpieces are Guardians of the Galaxy in which there is an ensemble cast, who are assigned a roughly equal amount of importance and screen time. Every actor or actress had their significant character with substantial importance, they were equally imperative and without any single character, the movie could not have a huge success as that of today. Every stars acting was remarkable with true emotions and perfect attire. These attires have gained a noteworthy importance and now today is the dream of every fan to wear it and flaunt it publically. Guardians of the Galaxy is a momentous movie where many talented stars worked together under a single banner. Such names include Chris Pratt, Vin Diesel, Bradly Cooper, Zoe Saldana and many more. Among these, Chris Pratt with the character name Star Lord is seen wearing some tremendous outfits that are trendy as well as stylish. The stunning outfits of Star Lord are glaring enough to make one fall in love to it. All the outfits he wore in the movie are stunning and elegant with sophisticated style. Jackets Inn feels pride and honor to offer a competitive variety of Star Lord Jackets at the online store. 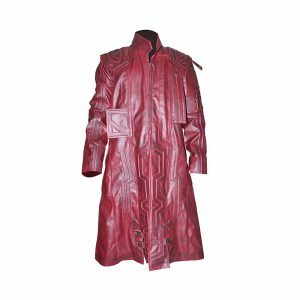 You can find GOTG Star Lord PU leather long coat and Guardians of the Galaxy 2 Star Lord jacket, made with premium quality and being available in reasonable prices. We always follow all the protocols and standards of manufacturing and provide exceptional quality zippers, buckles and buttons. We never compromise over quality, no matter what. So order now to believe in our quality and enjoy the perfect trendy outfits this winter.